I love when we have (read: make) a little more time for art during the week! I feel like my students really enjoy the opportunity to use their brains in a different way, and I relish in opportunities to encourage my students to apply their skills and preferences to artistic endeavors. Last week, we took time over two days to create snorkeling self-portraits, inspired by this blog that I found over a year ago. I originally taught this project as part of a daily activity for a summer camp I directed at a private school. We used face templates that I found from this awesome website and fish templates that I found from a quick Google image search. I believe using templates/cut-outs is really helpful, especially when doing this project within a limited time frame and with younger students. My second graders still need lots of guidance when it comes to arts and crafting, and I always do projects with them or circulate the room the entire time they’re working, so that I can be there to assist with cutting and gluing where it’s needed. We happened to be reading about jelly fish in our curriculum this week and we wrote about what life would be like if we were sea creatures. Though not identical to our curriculum studies, it was great to tie in our art lesson to the ideas we were discussing for our academic studies last week. I think it’s also nice to throw a little summer into the midst of winter whenever possible! Find more photos of this project on my Pinterest page, in Simple Second Grade Art and Simple Summer Arts and Crafts. While I tend to lean more toward the artsy-style with projects I enjoy doing with my class so that they learn fundamental visual arts skills, I know that a simple craft can be just as fun to complete and also aids in developing fine motor skills in tiny hands. Last week, I did a quick Google search on my break before finding an image that inspired what we would create–fall wreaths, using construction paper and our hands for the shape! To add a little academics to our craft, I wrote fall words on the board for students to copy onto the pieces of their wreaths. Find some photos of last week’s art time below! One of my favorite art activities to do with my class is painting with marbles! This idea comes from Art Hub for Kids and their video below. I’ve always wanted to do a focused lesson on September 11th for my students, but I never felt that I had the appropriate tools to do so in the past. This year, I found some wonderful resources that helped me shape an open and informative discussion, craft project, and a week of social studies mini-projects for my class! We began by watching this video, which was free and available to watch the day after 9/11. We had a delicate discussion about how people are free to feel how they feel but that it is not okay for people to hurt other people because of their feelings. Our discussion ended with me guiding our class to the idea of the phrase “United We Stand.” I decided to focus on this positive phrase in case some of my students were feeling sad after watching the video and also because I saw that it was a writing prompt on some of the materials I wanted to use for social studies time, that I downloaded from Teachers Pay Teachers. Though I did not end up using the craft from Just Wild About Teaching‘s “Patriotic Craftivity,” I absolutely loved all the writing prompts and other printables in this bundle. Those materials helped me create an entire week of focused social studies activities and discussions! The craft project I ended up doing with my class in honor of September 11th was based on a Google search and this image from Teacher by the Beach that really caught my eye. 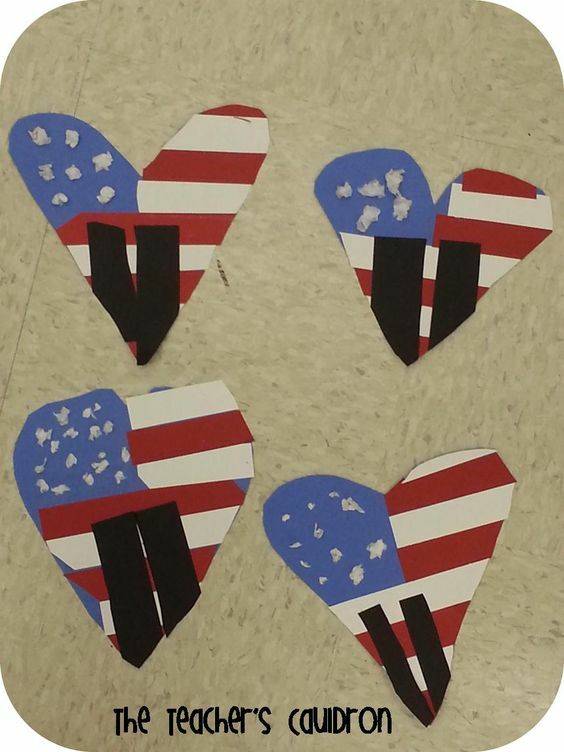 Though my class didn’t have enough blue construction paper for a blue heart background, I found some heart-shaped templates from this fantastic website, and I had my students glue on a blue square and red and white strips of construction paper. We also painted on stars, and I told my students they could be “abstract” with how many stars were in the blue part of their art piece, though we knew from our KWL discussion of America that there are 50 stars in the United States of America flag! Find our finished products below! In deciding what project I wanted our class to focus on for today’s Art Day, I thought it would be fun to have a little discussion about the recent holiday we celebrated–Labor Day! Before beginning to design our tool belts, we had a discussion about the meaning of the word labor (Google told us it means: “work, especially hard physical work”) and watched a cute little video about people who work. 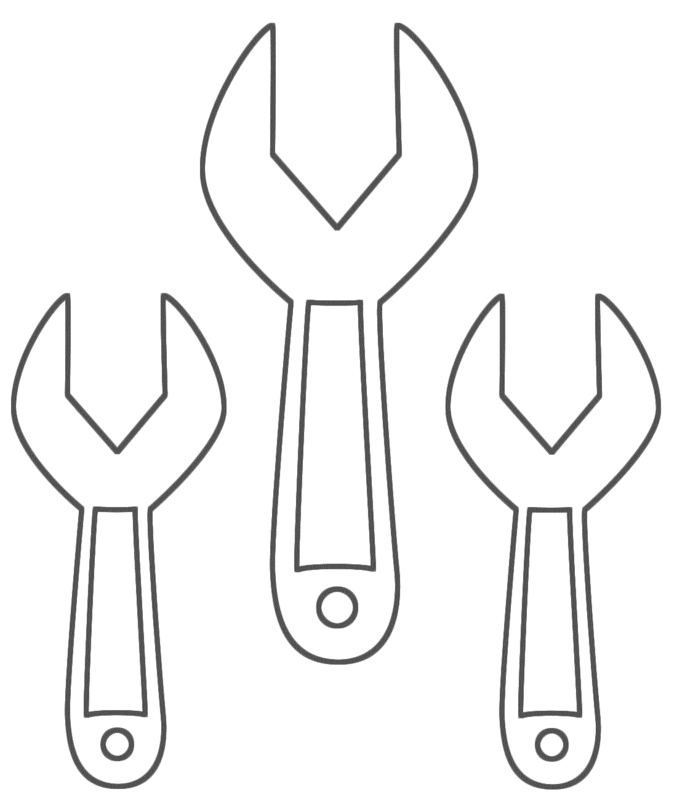 Later, we colored some tools. (Click the pictures below to enlarge.). Finally, Miss McWoodson stapled together our tool belts! This was a very fun, simple craft, and I like that it related to the recent holiday we had in the United States. It took me longer than expected to fit students for belts (hence me only getting through about 5 students today!). Also, I can’t figure out how to make the belt adjustable. Future goals! For last week’s Wednesday Art Day, we combined materials to created mixed-media pieces. I knew that I wanted to have the class create something with circles, as I enjoy starting off the year with classic Wassily Kandinsky circle projects, but I wanted to put a different spin on the project. Using circles found HERE and prototypes found HERE we created lovely circle flowers last week! Find them hanging in our hallway tomorrow morning! Find a few close-ups of student art work HERE. Learn more about Kandinsky circles from the video below, which demonstrates how to create the circles using oil pastels! Happy Tuesday! Below are a few announcements for this week. PARENT SURVEYS: Please remember to turn in your completed Parent Survey to me, anytime this week! If you have not picked one up from me yet, please remember to grab one near the sign-out binder when you drop off or pick up your scholar from our classroom. ART: I stayed late after school yesterday to hang our first abstract art pieces! For last week’s Art Day Wednesday, we created “Abstract Self Portraits” using torn construction paper and warm or cold colors to illustrate our faces! Names are on the back of these pieces, so please ask your scholar which piece is theirs (or see if you can recognize them! ).